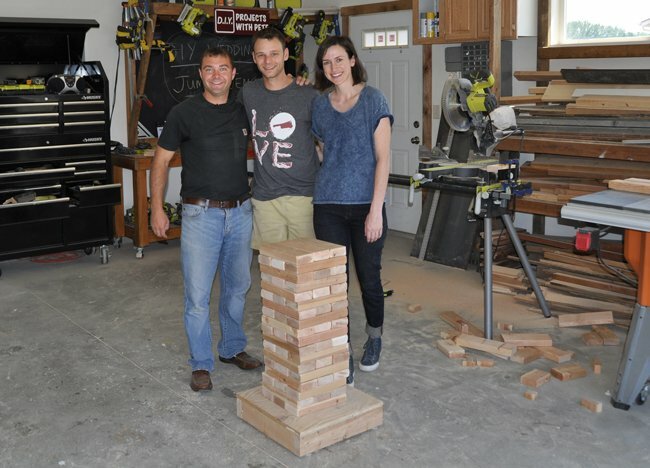 Learn how to build a Giant Jenga Game. This Jenga game is the perfect yard game and we built this for my younger brother, Sam, and sister-in-law's, Lindsay, wedding. 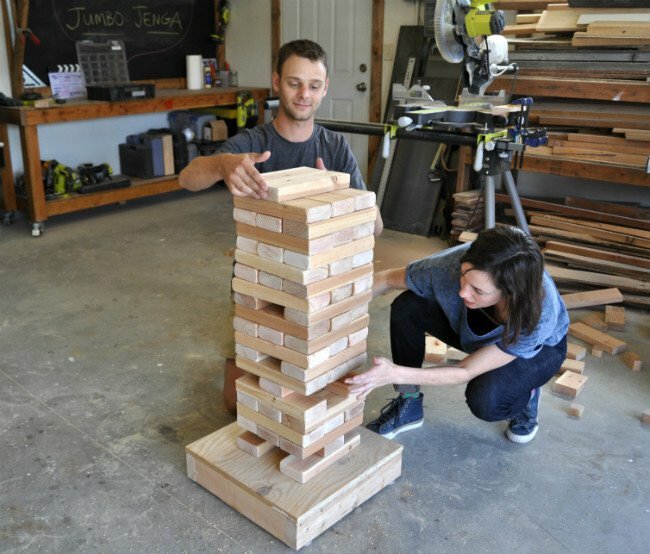 The Jenga Game is an easy DIY project that you can accomplish in just a couple hours and can be built out of recycled 2″x4″ boards or a few new 2″x4″ boards. 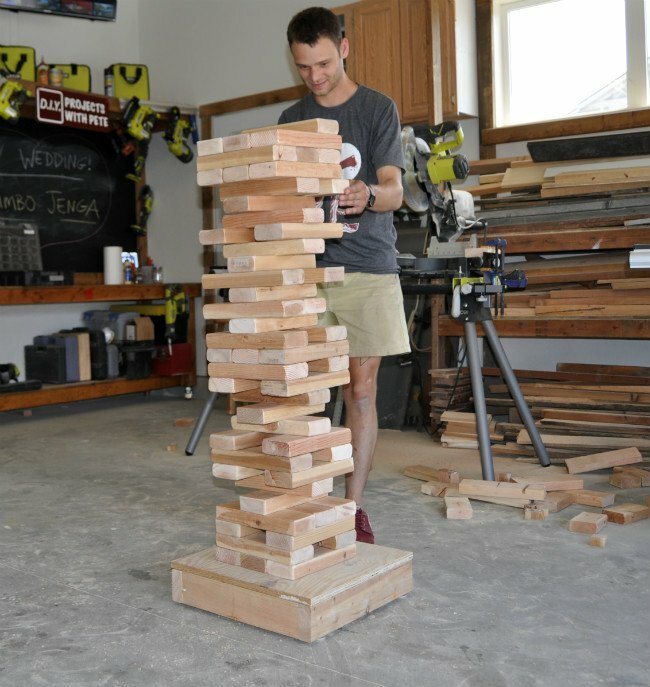 In this tutorial you will learn how to make a DIY Giant Jenga Game. Be sure to watch the video (above), as it shows a lot more of the how-to steps and details of this project. 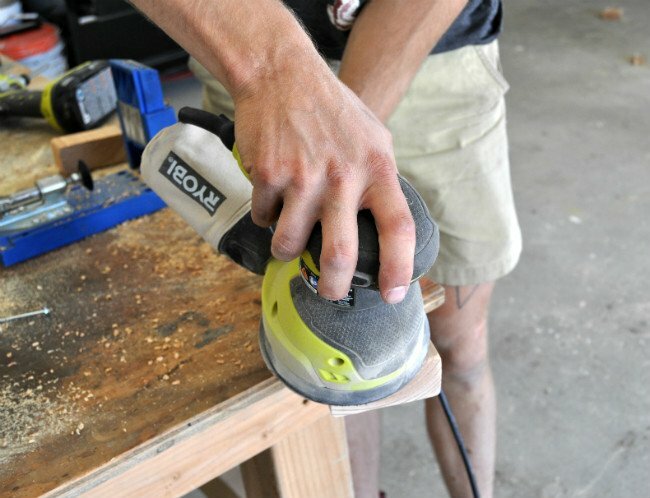 Cut the 3/4″ plywood to 18″x18″ using a circular saw or even a table saw. Then make a frame out of 2″x4″ boards. 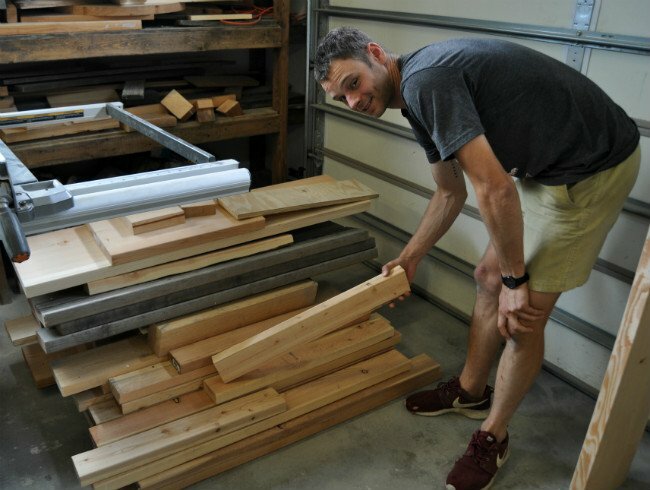 Cut two boards to 15″ and two boards to 18″ using a circular or miter saw. 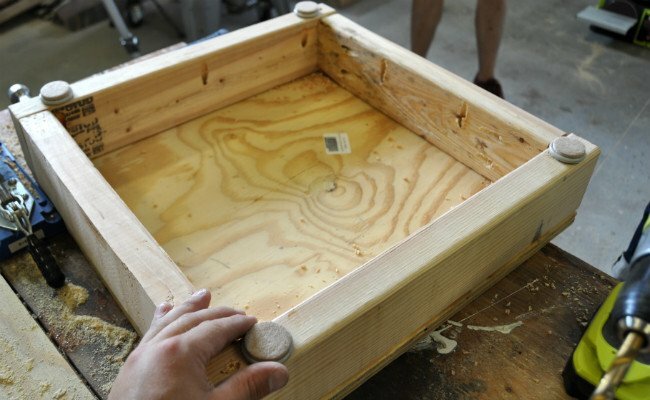 Then, using a Kreg Jig and Kreg Screws, we attach the 2″x4″ cut boards to the plywood and to each other to form the base for the platform. We then screwed holes and attached the threaded self-leveling feet on the platform. With the 2″x4″ boards, we cut 54 Jenga pieces at 10 1/2″ each. I'd recommend setting up a ‘stop' on your miter saw to make the process go much quicker. 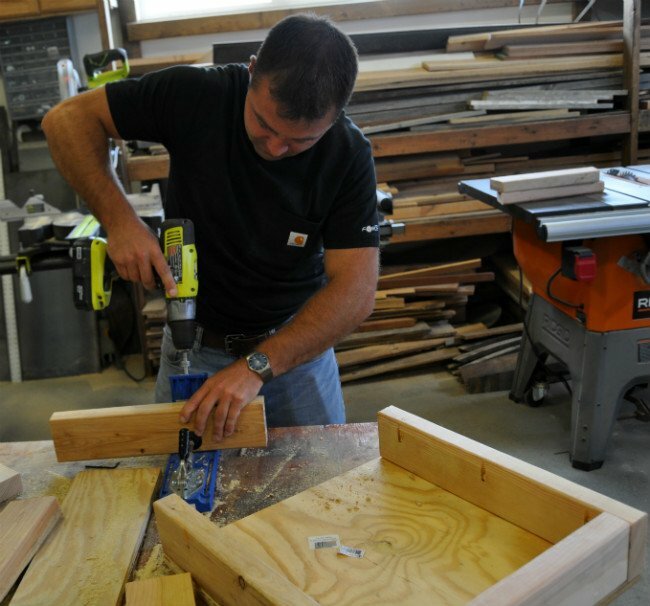 Using either an orbital saw or a benchtop belt sander, we sand each piece smooth on the ends and the sides. We had a pretty good assembly line going between me cutting the pieces and passing down the line to my brother and his fiance who were sanding. Place your constructed plywood and 2″x4″ platform on the ground and stack up the 2″x4″ Jenga pieces in rows of 3, alternating the direction of stacking every layer. This is a great, fun project to make with a friend or family members. This Giant Jenga Game is a hit at wedding receptions, family reunions, bbq's, or any other get together. See how long you can play until it all falls down! 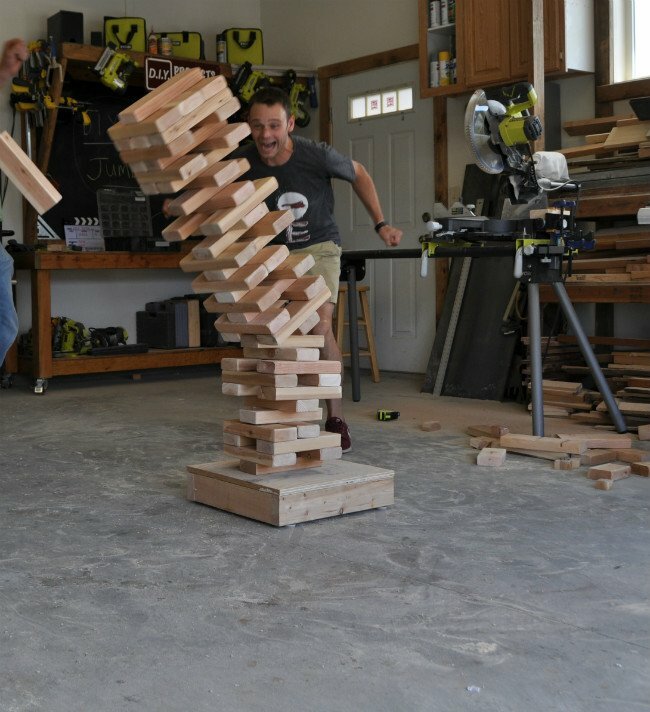 Have fun and build a DIY Giant Jenga Game!